C60 measurement of surface tension / interface tension is drop shape analysis based system which focuses on measuring interfacial chemical properties. It can be used to analyze interfacial chemical characterizations like surface tension and its contributions (dispersive force, polar force), interface tension, surface free energy of solid and its contributions (dispersive force, polar force, hydrogen bond force, Lewis acid & base and more), interface rheology, interfacial viscosity, adhesive work, wetting line, wetting behavior via analysis of drop shape or lamella profile of drop / bubble that shaped on interface of liquid-gas, liquid-liquid, liquid-solid or liquid-liquid-solid. It also can be used to characterize / analyze / predict / describe various vital physical chemical properties, such as spreading, wettability, adhesion, absorption, competition, sedimentation, penetration, biocompatibility, foaming, solubilization and surface heterogeneity, as well as research of new material (super hydrophobic / hydrophilic material simulation), QC (analysis of surface cleanness). 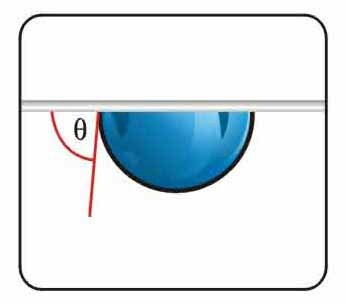 measurement of surface tension / interface tension Their modularized design makes tens of thousands of possible different combinations available, which are undoubtedly your above-all choice for your high measurement precision in interfacial chemical analysis. The integral instrument is consist of sophisticated optical mechanics, optical vision system, precision dosing system and professional interfacial chemistry analytical software CAST® 3.0. Global advanced telecentric lens, parallel background light, high-speed video system of 87-340 frame/second, precision positioning stages, and ADSATM based CAST®3.0 are all standard configurations, which provide you state of the art and most professional research conditions. measurement of surface tension / interface tension Note: CAST®3.0 consists of different software modules. Different functions rely on different modules clients purchase. First, single or several dynamic images of drop/bubble are captured for us to analyze its key information like drop shape edge and geometric dimension via sub-pixel image recognition technology; By inputting some important parameters like density, gravitational acceleration, magnification and others, we compare and fit the real drop shape profile with theoretical curve generated by sophisticated mathematical analytical models (such as circle, ellipse, polynomial, spline curve and especially Young-Laplace equation fitting) using least square method; and finally surface tension of liquid-gas, interface tension of liquid-liquid, contact angle of solid-gas/liquid-liquid-solid are calculated. Our great achievement is: initiating ADSA based Young - Laplace equation fitting method and apply it into analysis of interfacial chemical properties after our 3 decades endeavor. 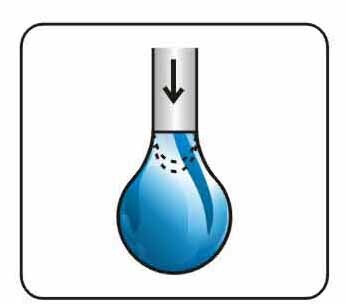 →Surface tension: Dynamic surface tension dependend on temperature, concentration, time, pressure, electrical field and more; surface tension of liquid (pure liquid, mixture liquid, melts)-gas. Pendant drop method and sessile drop method that C60 adopts is quite suitable for following industries: (1) high-viscosity material, such as adhesive, polymer and resin; (2) material that requires high temperature, such as metal and coal; (3) environments simulation such as high pressure and temperature of oil recovery field. → Interface rheology, surface elasticity, relaxation study, hydrostatic pressure, etc. New surface characterization, surface purity test, surface treatment evaluation of solid, formulation of liquid, surface cleanness analysis, adhesion of liquid-solid / solid-solid, characterization of surface printing, wetting analysis of glass, plastic and metal, analysis of surface modification. 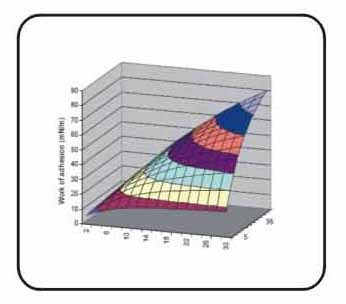 - Analysis of hydroscopicity and printable for paper, paper diaper, sanitary pad. - Applied research of surfactant, e.g. cosmetic, detergent, emulsion, petroleum (tertiary oil recovery), etc. measurement of surface tension / interface tension from USA KINO have obvious advantages because our more professional knowledge, R&D capacity and product quality are comparable to others in the industry from US and European. We guarantee profession, stable and convenience in mechanical control. The mechanics are optimized by our practiced engineer in terms of precision optical vision system, which effectively improves mechanical compatibility without any structures complicated or appearance uglified. Uniquely-designed mechanism of up to 10 axis control (6-axis linear adjustments +1 rotation adjustment + 3 horizontal adjustments), to coordinate the operation of sample stage, lens, camera, dosing system and vision system. → Integrate designed instrument with mainframe made of high-grade aviation aluminum guarantees its handiness and fastness. - Precision positioning stages used in hardware control system, with resolution up to 0.01mm by manual and 0.007μm by software control respectively. - Crossed-roller bearing and precision vertical travel positioner used micrometer in sample stage lift control effectively ensures level control, base line detection of solid sample and load capacity (approx.6kg) of sample stage. - Precision positioning stage with micrometer and crossed-roller bearing guarantee smooth moving, as well as more accurate positioning control and focus distance adjustment with fewer backlashes. - Unique mechanism of fixed focal distance and high-precision adjustable positioning stage, with easier and more accurate focal distance obtaining, clearer and sharper image capture. 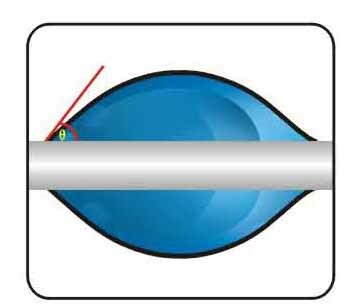 - Flexible focus control system and micro distance of needles moving (about 0.01mm) makes more accurate and easier operation of transferring drops, especially for super-hydrophobic biomimetic material surface test. - Small droplet within 5uL can be easily transferred with our ultra-fine needle or PTFE needle for super-hydrophobic surface. - Professional design of rotary positioning stage without backlash guarantees stable operation and accurate angle control with its accuracy of up to 0.1 ° by manual and 0.01° by software control as well as resolution of up to 0.0001°. - Integral rotation system controlled by rotary positioning stage, enabling sample stage to rotate with lens in order to hold drop image in field of view during capture process. The unique design makes accurate analysis of roll off contact angle possible without hard operation and bad precision when rolling the entire instrument, as well as avoiding drop disappearing from the field of view when partially rotating. - Besides, just a simple switch can enable of sample stage rotating only. (Manual and electronic tilting base for option). - Except one complete machine level adjustment via quadrupled tuning knob and one precision tilting angle adjustment of lens and camera via 1 axis tilt platform stage with micrometer, we provide one multi-axis tilt platform with micrometer to adjust the level of sample stage and one zero-backlash rotary stage to roll the sample stage in addition. All these guarantee the accuracy of base line detection and the measurement of roll-off contact angle. C60 uses high-precision one-axis tilt platform to adjust tilted angles of lens and light source, which improved adjustment accuracy of angle via high-resolution micrometer. - Adjustment both by hardware and software with better base line detection. The level adjusting mechanism, illumination-adjustable LED cold light source as well as CAST 3.0 software system provide you strong assurance of better base lines detection, and more convenient for measuring roll-off angle and advancing / receding contact angle. → The adoption of communication port-USB2.0 in system of mechanical moving control and camera ensures better compatibility. → Professional high-precision syringe pump with accuracy of droplet control down to 0.002uL, which can be applied to high-precision repetitive sample dosing. → Communication port-USB2.0 guarantees better compatibility. → Syringe pump with tee-junction dosing system is optional available and it can be easily upgraded to multi-channel pump (up to 8 channels). → Dosing system of up to 8 channels and 8 needles is specially designed for dosing of multiple liquids in measurement of surface free energy. → Ultra micro volume dosing system of 10nL, 5pL, 15pL, 800pL and more are optional available for measurement of single fiber contact angle and contact angle of um size sample in industries of semiconductor, chip and semi-electronic. → Needles of different size (10-34#) , different materials (stainless, PTFE , PP) and needles for special use like curved needle for captive bubble method. They can be used for measurement of normal contact angle, and also for dosing and drop transferring in measurement of super-hydrophobic sample and high-viscosity sample. 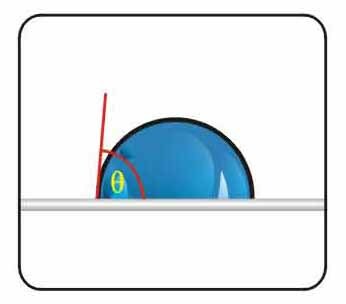 It can be used to measure surface / interface tension and contact angle by sessile drop and captive bubble as well as surface / interface tension of liquid-gas / liquid-liquid by pendant drop. RealDropTM method is quite different from select plane based Young-Laplace equation fitting method, which adopts AFLI and 4th generation RealDropTM technology and achieves higher measurement accuracy without any experience calibration value. → Unique interface tension measuring system of liquid-gas / liquid-liquid with Young-Laplace equation fitting method based on Bashford-Adams table, ADSATM(Runge-Kutta arithmetic and RealdropTM method) and capillary pressure method. 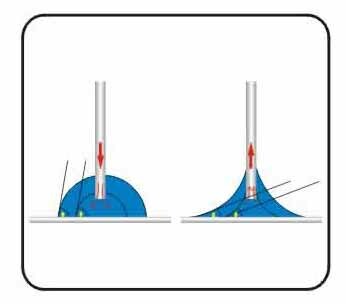 measurement of surface tension / interface tension can be used for surface tension measurement of medium-high viscosity sample, dynamic surface / interface tension measurement of surfactant, and oscillating drop measurement. 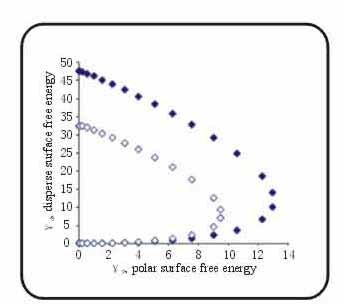 → Twelve surface free energy calculating models, providing you more options to estimate surface free energy and its distributions. Exclusively provided 12 methods for estimating surface free energy, e.g. Equation of State (Neumann et al. ), Good-Girifalco, Owen-Wendt-Rabel, Simple Fowkes, Extended Fowkes, WU method 1-2, Schultz method 1-2, Acid-base (Van OSS & Good), Jhu, and Zizman Plot (critical surface tension) method, measurement of surface tension / interface tension can be used to measure free energy and its distribution (dispersive force, polar force and hydrogen bond value, and Lewis acid-base, etc.) of low / high energy solid surface. → Unique technology of wetting behavior analysis (WBA / wetting envelopes). A 2D map of wetting envelope can be constructed by using the components of surface free energy and corresponding method (such as OWEN), and a plot produces to show how wettability occurs. It is another way of understanding contact angle, hence degree of wetting, arise from an understanding of the force existing in the material and between the materials. → Unique video recording function. Measurement process can be recorded into AVI format for later use. → Rod, thread and tilted plate method based interface tension and contact angle measurement for analysis of contact angle of single fiber. (Need to choose and buy related accessories). → Standardized windows technology based video capture technology with better compatibility. The standardized design of video capture method with windows multimedia technology enables the compatible of various contact angle meters around the world. Just enjoy the convenience brought by CAST ®3.0. It can be used to automatically analyze time-dependent interface tension/contact angle/volume/wetting line, and image is one-to-one correspondence with data for you to conveniently analyze measured value at any time. 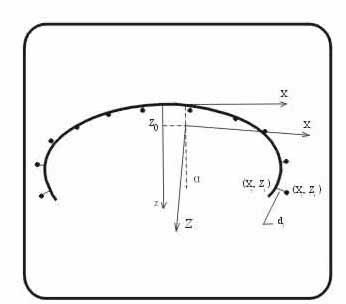 Exclusive curve base line based circle- fitting or curve-fitting of unilateral arbitrary curve shapes with easier operation and achieving more accurate result. → Dual-Software Triggering Technology for analysis of complicated dynamic/static contact angles. Unique dual-software triggering technology of CAST®3.0 can not only be applied to measure static contact angle but also advancing / receding contact angle, roll off angle, time-dependent (standard speed is 25 FPS, and camera with higher speed are optional) contact angle and zero-time contact angle of ultra-water absorption material ( e.g. powder, fiber, paper, and artificial periosteum). It is applied more extensively with better measured result. (1) New-generation wizard UI. Our software will implement measuring contact angle, surface free energy automatically at the touch of a finger according to wizard UI. Besides, with our 140-page user manual, you can operate the instrument easily without any professional training. (2) Unicode based software interface. Its English user interface can easily be changed to other language (such as Simplified-Chinese), and makes it more convenient to operate. (1) Fully automatic. Just press ”Measure”, images capture, contact angles calculation, data storage and real-time display measured value will be done without manual intervention. (2) Manual modification function. Double-click ”Modify”, you can modify measured value by captured image, and software saves the record of operation trace conveniently to avoid errors of automatic measured values. (3) Real-time graph. Left/right contact angle, average contact angle, adhesive work, surface free energy based on equation of state method can be real-time displayed without extra calculation. 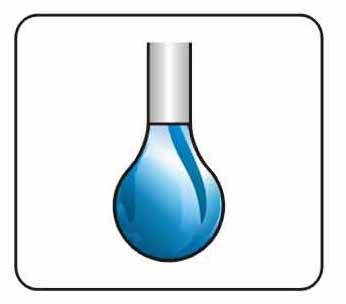 We provide 300 kinds of liquid with 800 data values of liquid surface tension and its contributions as reference data or for faster analysis of surface free energy of solid. √ measurement of surface tension / interface tension Measured data exportable. → All measured data can be exported into Excel file and image file into BMP file, which can be easily imported into scientific article and testing report. SM01 is main module of CAST®3.0 with functions of image capture, image recognition and processing with a sub-pixel accuracy, curve fitting, database management, which can be used to measure surface / interface tension and contact angle by sessile drop and captive bubble as well as advancing / receding contact angle / roll off angle / equilibrium contact angle / thermodynamics contact angle. Optional with Select plane method based Young-Laplace fitting technology (Andreas-Princeton, Springer, Huh, Lin, Hansen); measurement of surface tension (SE) of liquid and its contributions (dispersive force, polar force, hydrogen bond value and more) in terms of liquid-liquid interface tension. 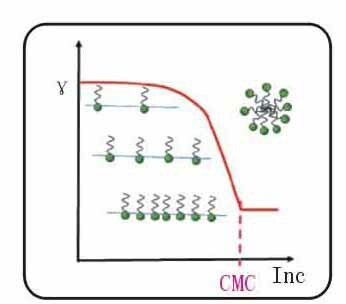 SM04 can be used to analyze low interface tension and its time-dependent properties used constrained sessile drop that formed in a sharp edge needle. SM05 measurement of surface tension / interface tension is used to measure contact angle of fiber for covered drop via max Length-Height method. SM06 is used to analyze interfacial rheology, surface elasticity, relaxation study, hydrostatic pressure, etc. SM08 is used to measure contact angle for large sample. 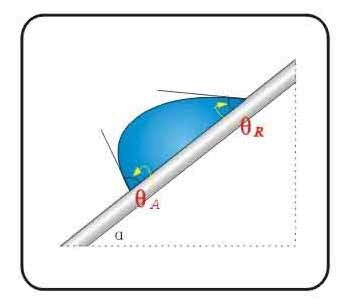 SM09 measurement of surface tension / interface tension can be used to measure asymmetry contact angle and advancing / receding contact angle using Young-Laplace equation fitting method . SM10 can be used to analyse dynamic energy of drop adhesive / un-adhesive on solid surface. → SM11: ADSA－LMP / Lamella & menisci profile analysis by Young-Laplace equation fitting method, etc. 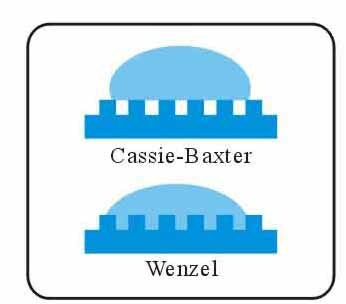 Lamella & menisci curves based on Young-Laplace equation fitting method can be tailored to measure interface tension or other interface chemistry properties. (1) and (2) are two temperature control systems for controlling temperature of liquid samples and solid samples respectively. Clients can purchase either or both of them. (3) Special temperature heating chamber: Any special requirements for temperature control, such as 200℃ and 400℃, please contact us for confirmation. measurement of surface tension / interface tension is recommended to use water circulator for liquid temperature control. → measurement of surface tension / interface tension Contact angle measurement in high-temperature of 1400℃, 1700℃, 1800℃, and 2000℃ can be realized; a down payment is required for custom maded. → measurement of surface tension / interface tension Contact angle measurement in vacuum environment or different gas environments can be realized; a down payment is required for custom made. → Sample chamber: Samples can be kept completely stable and free from effect of temperature and light dazzling; a down payment is required for custom made. Method of pendent drop or sessile drop is used for measuring interface tension between melted solid materials and air; a down payment is required for custom made. Thermo-stating sample chamber: control of humidity and temperature. → Various sample holders: For fiber, thin film, paper, powder sample chamber, slot for fixing hand or leg, holder for fixing cylinder; specific holder can be custom made. → Sample vessel made of optical quartz glass with size of 100*120*36, 46*36*47, 60*32 and more, for analysis of liquid-fluid-gas interface tension and interface tension via captive bubble method. → Full set of high-precision micro syringes: 25μL, 100μL, 500μL, and 1000μL, etc. 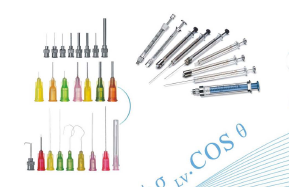 → Full set of needles: PTFE, stainless steel (various OD such as 2mm, 1mm, 0.5mm,0.3mm, 0.23mm,etc. ), plastic, and curved needles for captive drop method etc. → The measurement of surface tension / interface tension designed by USA KINO enables higher control precision and more flexible control mode. Oscillator with different oscillation frequencies and amplitudes is available at your option. → Measurement of surface tension / interface tension Optional sample dosing syringe: 0.5μL, 1μL, 5μL, 15μL, 100μL, 500μL and 1,000μL etc. → The oscillation waveforms cover sine wave, cosine wave, triangular wave, linear wave and saw tooth wave without attenuation or distortion when below 2K Hz. 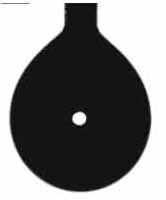 Calibration standard set for circle fitting, Young-Laplace fitting (sessile drop, pendant drop) with metrological certification is provided. “*” marks the major difference between variants. 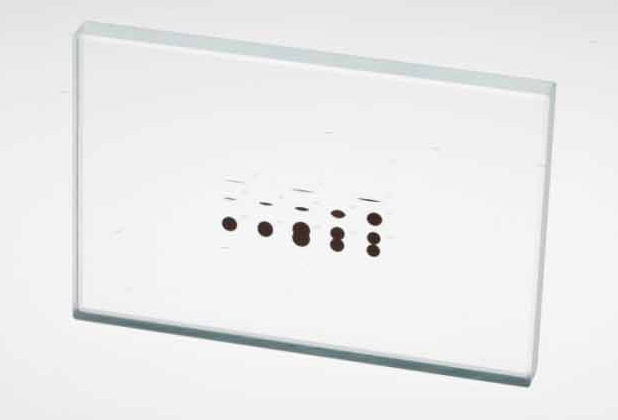 Special holders for fiber, films and leaf that are used to analyze contact angles of fiber or samples with poor planeness surface. Disposable needles, including 0.24, 0.3, 0.5, 0.9,2mm OD stainless steel needles, 0.2 OD needles as well as PTFE needles, etc., especially for measuring contact angles of super-hydrophobic materials or contact angles between glue and solid materials. 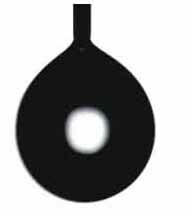 Pendant Drop, Sessile Drop (liquid/gas, liquid/liquid/gas), Captive Drop, Tilted Plate, and Oscillating Drop. 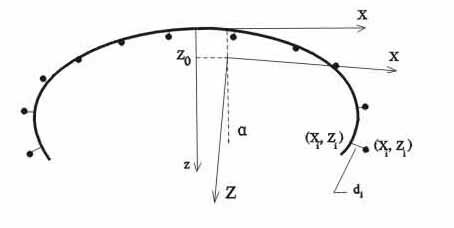 θ/2 (WH), circle fitting , ellipse fitting , RealDrop™ , curve ruler (tangent fitting ), Spline curve-fitting , and Young-Laplace equation fitting (ADSA™), etc. Data acquisition: Combination of both full-automatic measurement and manual modification. Just press “Measure”, the software will complete the whole process of capture, finding edge, finding sensitive spots, fitting curves, calculating contact angle values, and displaying calculation results without manual participation so as to reduce the effect of human factors. Contact angle measuring technology: mathematical model fitting and real-drop contour measurement solves the problem of measurement of asymmetric drop shape or drop without apex. Automatic curve base line correction: Correction of upper convex sample surface, lower concave surface, or roughness of surface. Image capture methods: single/continuous capture with 25 FPS. Higher speed of 60 FPS, 100 FPS, or 1,000 FPS are optional available. Unique dual-software triggering technology: Measurement of first-time-point contact angle for analyzing powder, paper and other hygroscopic materials; whole-process capture of small contact angle measurement. Calculation and comparison of left and right contact angle and their average values. Automatically generated data graph: Real-time observation of contact angle changes. Powerful database management: one-to-one correspondence of data and drop images; backup, compression, and exporting to Excel files; measured values and curve-fitting results can all be saved into exported image, visually and clearly. Video recording: recording live images in AVI format and also for PPT file. Automatic calculation of droplet volume, adhesive work and Equation of State based surface free energy for measurement of surface tension of films, to replace Dyne test pens. Exclusively providing 12 methods for calculating surface free energy, e.g. Equation of State (Neumann et al. ), Good-Girifalco, Owen-Wendt-Rabel, Simple Fowkes, Extended Fowkes, WU method 1-2, Schultz method 1-2, Acid-base (Van OSS & Good), Jhu, and Zizman Plot (critical surface tension) method, for measurement of surface free energy and its distribution (dispersive force, polar force and hydrogen bond value, and Lewis acid-base, etc.) of low/high free energy solid. 1.The above production pictures and technical specifications are subject to change without notice, and the latest confirmed product information shall prevail. 2. All rights reserved by USA KINO Industry Co. Ltd.